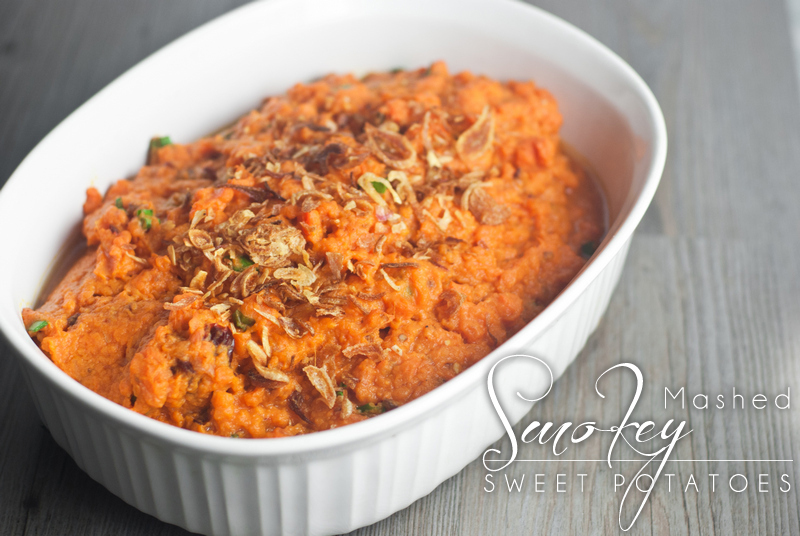 Our Primal Desire Smokey Mashed Sweet Potatoes are an explosion of sweet, smokey and spicy in your mouth. Even now, looking at the photos, I am getting my drool on. These were paired with The Primal Desire Chicken Raj posted last week. Do you ever stop and think about where your day goes? And when the days turn into weeks, months and years, it is good to sit and reflect. For at least a moment before you begin progressing again. I remember the day clearly (a little more than 2 years ago): Raj was taunting me with his leftovers, we were doing a paleo challenge and he was cooking up a storm, I was sitting in the parking lot of Quality Greens text messaging with him (procrastinating grocery shopping) and we were trying to come up with a name for our potential business, still not 100% concrete on what our business was going to be. That day, and this meal aroused The Primal Desire into what it is today. This is how we started, with a passion for delicious-good for you food, and a little friendly taunting each other – and our friends, about how tasty and beautiful our healthy food was. And as we forge forward the lust for drool-inducing paleo food continues! 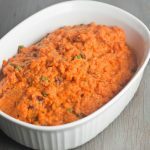 Smokey Mashed Sweet Potatoes get their smokey and spicy flavors from smoked salmon and chipotle peppers. 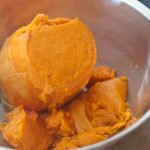 Cook the sweet potato, I used my Instant Pot, and the mammoth tuber was simply cut to fit, placed on a trivit, 1 cup of water added and cooked on high pressure 10 minutes, with a natural pressure release. When it was done, the skins slid right off and it was ready for mashing. No Instant Pot? You can buy one here, or use the old-fashioned method, peeling and boiling to mash. 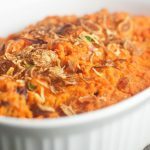 Stir in remaining ingredients: garlic, smoked salmon, coconut yogurt or coconut milk, green onions, diced up chipotle peppers in adobo, chipotle powder and salt. Make sure it is well combined and garnish with deep-fried onions (optional). 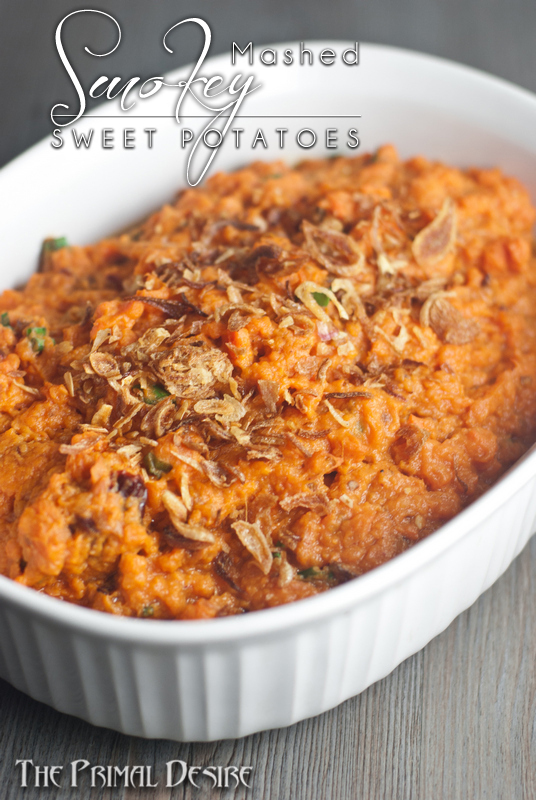 Want to know more about sweet potatoes? 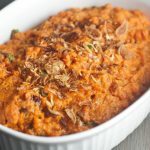 Check out this Sweet Potatoes 101 article. Looks yummy.. I love sweet potato. Where did you buy Chipotle Powder, I can’t seem to find it, but I can find the can. Hmmm, the one I use is from Epicure. But I’m sure I’ve seen it in the spice aisle though. Looks great. Thanks for sharing,.,I will make it without the salmon! Good call Lynn. No Salmon for you!